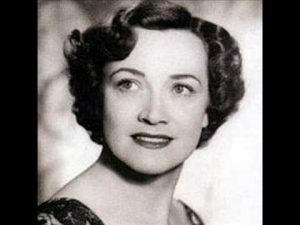 Kathleen Ferrier was born in Lancashire in 1912. She moved to Silloth in 1936 when her husband, Bert, was promoted to manager of the district bank. Kathleen was a keen singer and pianist and was often accompanist for Silloth Choral Society. She also gave piano lessons to the local children. In 1937 she entered the prestigious Carlisle Music Festival and came 1st in her piano class, 2nd in mezzo soprano class and 1st in contralto class. She also won the Rose Bowl which was competed for by all the singers in the festival. After this Kathleen entered other miusic festivals and won many of the singing competitions. Her entry in the 1939 Carlisle Music Festival led to singing lessons and her stage career. In 1940 her husband was conscripted and their marriage ended. Kathleen moved to Carlisle and shared her house with her sister, Winifred and their father, William in 1942. She left Carlisle to live in London. Kathleen died of cancer in 8 October 1953 aged 41. Her time in Silloth is marked by a plaque on the outside wall of the former National Westminster Bank on Eden Street and in 2015, Mrs Wilson’s coffee shop and eaterie on Criffel Street was opened to commemorate her life and is well worth a visit. The Kathleen Ferrier Society (KFS) was formed to celebrate the life and music of Kathleen Ferrier, one of the world’s best loved singers. Her voice and warm personality ensured that she became one of the most celebrated British female singers of the 20th Century.